Recognizing walking and bicycling as healthy, accessible and green forms of transportation, the City has embarked on developing its first Active Transportation Master Plan. 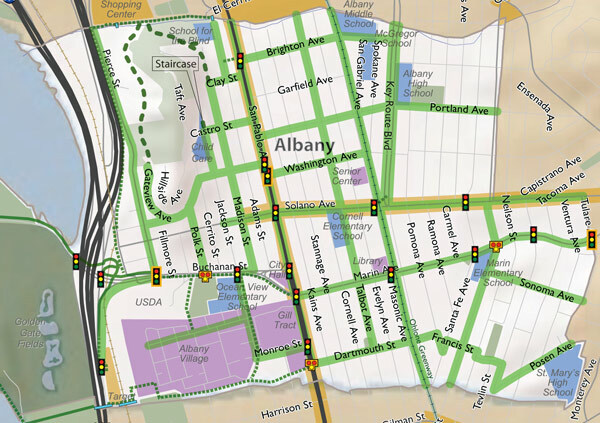 This plan will be a blueprint for the future of walking, cycling and other active modes in Albany. Draft maps of the cycling and walking routes to be proposed are now available. 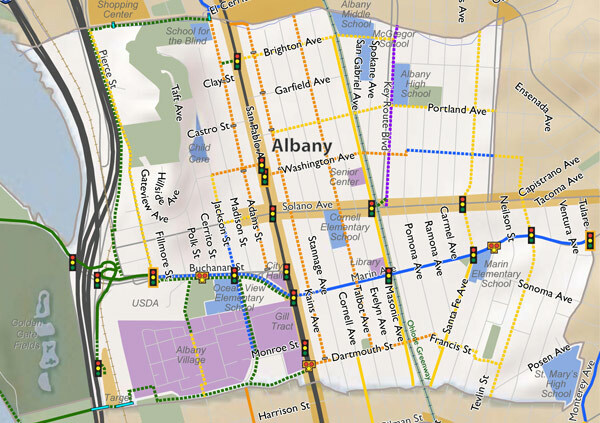 Please send your feedback on the proposed route networks or any other ideas for making Albany a better place to get around without a car to the Albany Strollers and Rollers’ discussion list, to one of Strollers and Rollers’ representatives in the process (Preston Jordan or Amy Smolens), or directly to the city staff and consultants preparing the plan. With regard to the proposed walking route network, obviously almost all of Albany is well served by sidewalks, which is a great inheritance for which we can thank those who came before us. Albany Strollers and Rollers purpose in requesting definition of a walking route network now is to make sure maintenance (such as repairing damage due to street trees) and improvements (such as upgrading access ramps) are focused on a network of routes that will connect people to the most important destinations in town. The intent of developing this network is to serve anyone who strolls or rolls on the sidewalks. The latter includes kids in strollers and those who are pushing them, wheelchair riders, and younger children cycling on sidewalks for instance. These groups are more sensitive to sidewalk conditions, and likely to be dissuaded from getting around car free or being compelled to use the street when they don’t want to. The website maintained by the consultant for the planning process http://albanypedbikeplan.fehrandpeers.net/. Strollers and Rollers looks forward to your input.